Cosmonaut Andrey Borisenko shares how the International Space Station inhabitants have their breakfast and what exactly space porridge has to do with an insulated boot, in the new episode of RT’s Space 360 project. Spacemen breakfast planning starts not when they are awake in the morning (if there’s such thing in space), but well beforehand while the crewmen are still on Earth. Specialists prepare the rations for each crewmember based on the results of cosmic food products tasting and rating during pre-flight preparations. “It doesn’t mean that everything will be done according to the cosmonaut’s requests, because not everything is possible. But specialists responsible for our menus try to do as much as they can for us,” Borisenko says in the new space video. An orbital breakfast is designed to be nutritious and healthy. “Let’s look at this bag right here. We’ll take out the cottage cheese with nuts that I was talking about. This is what it looks like when it’s delivered to the ISS. You can’t eat it just yet. We remove the packaging, we don’t need it anymore, so we put it in the trash container, that will later burn in the atmosphere along with the rest of the garbage removed from the Russian segment of the ISS,” Borisenko says. Food packages comes with two valves – one for pouring water in, and another to actually eat the meal. All the food bags are disposable and fit for a single use only, since it’s not possible to wash dishes in space. “Let’s not waste any time, and remove the porridge packaging as well. You can’t eat the food like this though, you can try to munch on it, but it won’t taste good,” it requires water to be added. Water is heated and poured into the food bags through a special device. 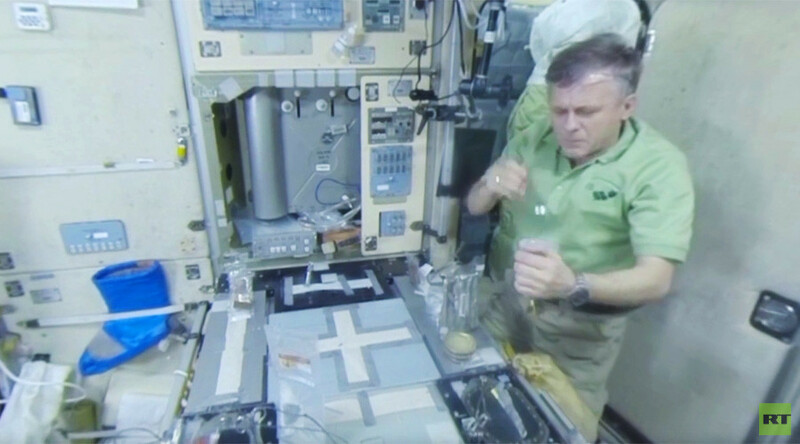 Various food types require different amounts of water, but cosmonaut Borisenko doesn’t like his porridge too runny and adds less water than the space kasha manufacturer advises. The bag should be shaken afterwards, since it’s not that easy to mix liquid with grains in space. After a whole lot of shaking, a most peculiar Russian space device enters breakfast preparation game. “We put the bag in the special device, it’s basically an insulated boot we use only for food preparation,” Borisenko explains. Cosmonaut Borisenko then proceeds to the cottage cheese with nuts and concludes his breakfast with a cup (a bag, actually) of coffee. Space 360 is a joint project of RT, Russia’s space agency Roscosmos, and Energia Rocket and Space Corporation. You can watch the video (and previous transmissions) from ISS on our dedicated website, available in six languages.